A boxer who dreamed of being a US champion, Tamerlan Tsarnaev was also drawn to Islamic extremism. To the end, he seemed alienated and lost. Tsarnaev was graceful in the boxing ring. "We were like, 'He's good,'" says fellow boxer Marvin Castro, who was standing outside the Wai Kru gym in a Boston suburb on Sunday. "An amazing boxer," says a martial arts trainer who works at the gym and asked not to be named. "Hard, fast, smooth. It's like watching Michael Jordan on the basketball court. Nobody here was good enough to train with him." At the time, Tsarnaev dreamed of becoming an Olympic champion. He told a photographer for a Boston University magazine in 2010 that he wanted to fight as an American. Boxing experts say he could have made something of himself. 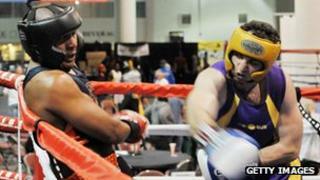 He won the New England Golden Gloves tournament in the open heavyweight division in 2009. "He was in shape and took it seriously," says Bruce Desmond, who serves on the board of directors for the Somerville Boxing Club in suburban Boston and is familiar with Tsarnaev's record as a boxer. Yet Tsarnaev chose a different path. He was killed on Thursday during a shootout with police. He and his brother are suspects in the Boston Marathon bombings. In recent years, Tsarnaev had become interested in Islamic extremism. A video on his YouTube channel, for example, featured a radical cleric, Feiz Mohammad, who lives in Australia. Mohammad is a former boxer, according to a 2010 report by the NEFA Foundation, which monitors online extremist groups. Mohammad talked about offering up children "as soldiers defending Islam". "Put in their soft, tender heart the zeal of jihad," he says in a videotaped lecture, "and the love of martyrdom." At the request of the Russian government, FBI officials interviewed Tsarnaev in 2011. They later explained it was due to concerns that "he was a follower of radical Islam". Tsarnaev's interest in Islamic extremism is an issue that is fraught with emotion and politically charged. Peter King, a Republican congressman from New York, has questioned whether the FBI should have done more to monitor his behaviour. Yet it is unclear whether Tsarnaev's interest in extremism is significant in the bombing case. "You see signs of radicalisation. He did seem to have some sympathies with Islamic extremist views," says Aaron Zelin, a fellow at the Washington Institute for Near East Policy. "But we have only pieces. It's hard to say whether he did this because of ideology, or had some other motivation." No one will ever know what Tsarnaev was thinking before he died, and his motives, whether ideological or personal, may remain forever murky. Still, he gave clues to how he felt about his life in the US and about his adopted homeland. Who are the Tsarnaev brothers? While he hoped to become an American citizen, Tsarnaev faced a series of setbacks. He made it to the Golden Gloves national tournament in Salt Lake City, Utah, in May 2009, for instance, but lost a match and was eliminated. Several weeks later police arrested him on a domestic violence charge. Tsarnaev was accused of "assaulting his girlfriend", according to a monitoring website, Spotcrime.com. Later, his request for citizenship was delayed. After speaking with him, FBI officials became concerned enough to hold up the process. Tsarnaev, who was married and had a three-year-old daughter, never became an American. In the years before he died, he travelled in different circles, spending time at a mosque on Prospect Street in Cambridge and at the Wai Kru gym. Yet he never seemed to find a place in either of these worlds. In some ways, he seemed to be in his element in the boxing world. He was certainly not the only one with a dodgy past. "We're not looking for saints," Mr Desmond says. "Kids who are attracted to this - there's always going to be an edge." A martial arts fan who works at the Wai Kru gym, Moses Etheart, says that being troubled or angry can work in an athlete's favour. "It's useful when it's under control," he says. He trains regularly - and saw Tsarnaev at the gym. At the gym, Tsarnaev was disciplined. He trained - and would also roll out a mat for prayer during his breaks. By many accounts, Tsarnaev was a loner with flashes of anger. People at the mosque on Prospect Street, where he used to come alone to pray, found him difficult. Once, says Nichole Mossalam, who works for the Islamic Society of Boston, he became outraged during a sermon. "The person giving the sermon made a comparison between Martin Luther King and the Prophet," Ms Mossalam says. "He made a verbal outburst." Tsarnaev seemed to take after his father, Anzor Tsarnaev, who was in the Russian republic of Dagestan when his son was killed. Anzor Tsarnaev, an auto mechanic who also liked to box, used to train at the family house on Norfolk Street in Cambridge. He would do pull-ups on a metal gateway in front of their house, a neighbour says. The neighbours were afraid of him. "He charged at me," says Rinat Harel, an artist who lives across the street. She recalls how the father used to repair cars on the street, blocking traffic. He also threw trash in neighbours' bins. Once she asked him to stay away from their property, and he flew into a rage. "He was cursing in Russian and stepped forward," she says. "It felt almost physical. He came towards me with his chest out - you know how gorillas do." In a 2007 lecture, declared "the most noble death is the death of a martyr"
In a lecture, The Enemy's Plot, refers to "American pigs"
Anzor Tsarnaev went back to Russia and his son stayed in the US. Tamerlan Tsarnaev continued to train as a boxer - and apparently held out hope that he would still become an American. Still, he never seemed to feel truly at home in this country, and remained basically alone. Armed and dangerous, he fled from the police with his little brother - but did not seem to have help from anyone else in the bombing. At this point, authorities have not indicated they think the Tsarnaevs had ties with a terrorist group, though they continue to investigate their backgrounds. Instead, Tsarnaev seemed to fit a profile of an individual whom US counter-terrorism experts have long feared: someone who has extremist views, or at least an interest in political violence, and who explores these subjects online. In some cases, they are angry enough about other things in their lives that they are willing to act on destructive ideas. Tsarnaev had once channelled his anger into boxing. At some point that ceased to keep him on track. When people at the Wai Kru gym heard about him on the news, says Mr Etheart, they were "disappointed". Then, they took Tsarnaev's trophies down from the walls and smashed them.